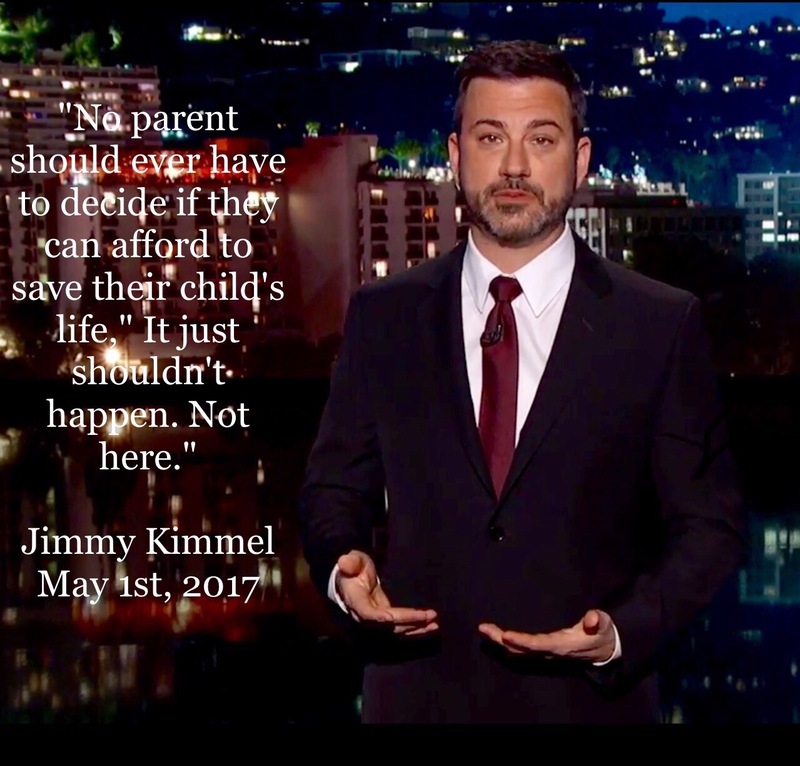 I think many of us can identify with what Jimmy Kimmel and his wife experienced when their new baby boy was born with a congenital heart condition – Tetralogy Of The Fallot with pulmonary atresia. It seems that we all know someone who has had tremendous and challenging health issues with their children or, perhaps, you experienced this health crisis with your child. With me, it was the latter and it didn’t end well. My little boy – David Joseph – died at the age of 3 with a rare disease called Alper’s Syndrome. However, for Jimmy Kimmel and his family, the wonders of technology coupled with the brilliance of his medical team made for a happier ending. It was no less stressful and terrifying but, in the end, this little boy has a chance for a healthier and brighter future. One can NOT be moved to tears and sadness when Jimmy was relating his experience after the birth of his son. In a 12 minute monologue at the top of Monday’s Jimmy Kimmel Live show, Jimmy shared his very personal story with his viewers. Holding back tears, he brought us along his journey while making us all realize that one can never take life for granted. Life can be just perfect one day and a nightmare the next. One never knows. It is truly in God’s hands. And this is why the present is a PRESENT. A gift one must cherish each and every day. Have a listen below and keep this little boy and his family in your prayers as he moves ahead to a couple of more surgeries in the next few months. Roseanne, I’m so sorry to hear of the loss of your beloved David. I truly believe he is one of God’s angels, bring hope and light to those in need. Dear MCL, I am so very sorry to hear about the loss of your son, David. So very heartbreaking. Jimmy Kimmel’s story about his son was gut-wrenching. Prayers that he recovers and leads a normal life. Thank you Louise. When I heard Jimmy’s story, the sad memory of my son’s death came back to me in a rush. Just the helpless feeling I experienced when happiness turned into unbearable sadness. I am so thrilled that Jimmy’s son was treated quickly and praying that he continues to thrive.